Photo taken April 21, 2007. Photo courtesy of Brian Sewell. 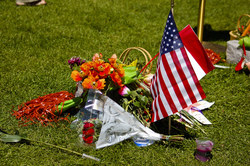 Flags and flowers accumulate at the drillfield memorial. Photo taken April 20. An unidentified visitor views the drillfield memorial. Photo taken April 20. 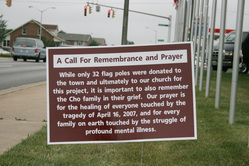 The Blacksburg Baptist Church posted 32 flags on South Main in remembrance of the 32 victims. 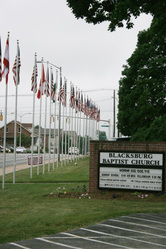 The Blacksburg Baptist Church posted 32 flags on South Main in remembrance of the 32 victims. In addition, the Church did not want to neglect Cho and his family. 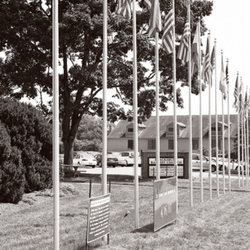 The university has hung several flags of the victims&#39; home country in Student Squires Center. 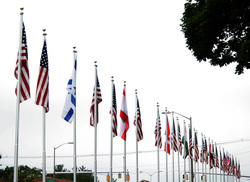 These flags flew at half-staff in front of the Metropolition Art Museum in New York City the weekend after the shootings at Virginia Tech, showing national solidarity and support for the University.